* As the zombies encounter people they become zombies. * There are also weapons boxes on the map. * If a human encounters a weapons box then the human becomes armed with 5 shots and if that human meets a zombie that human will kill up to 5 zombies. 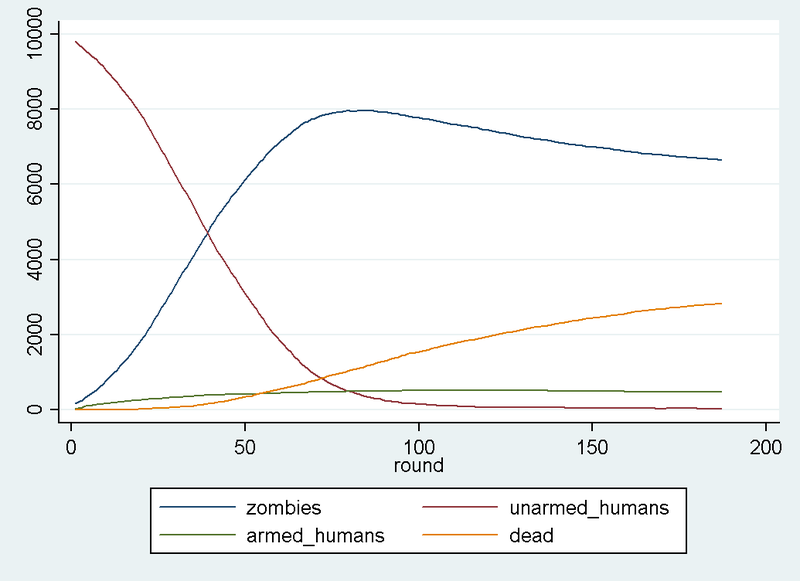 replace obj_type = "cases" if obj_type==""
replace obj_type = "zombie" if zombie_rand==1 & obj_type=="human"
replace infested=1 if obj_type == "zombie"
* People are distributed uniformly throughout the data. * Cases are disbributed chi-squared centered in the middle of the data. 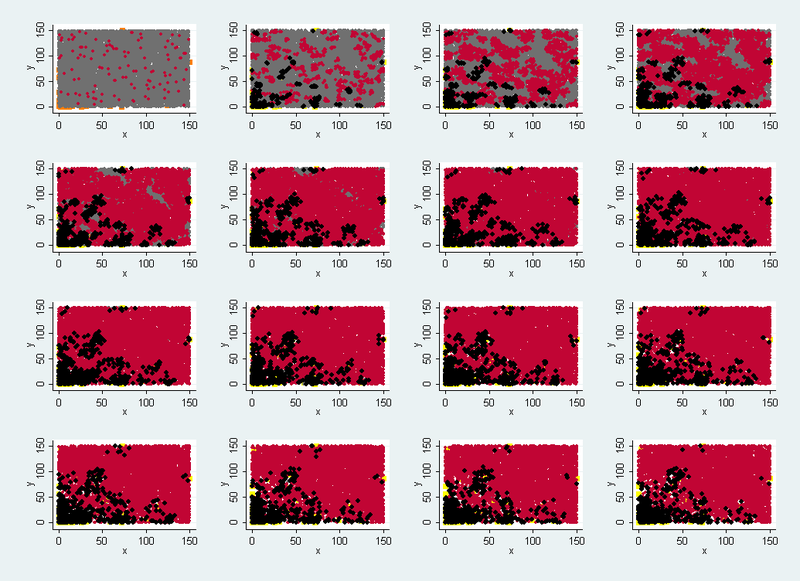 replace x=rnormal()^2 if obj_type == "cases"
sum x if obj_type == "cases"
replace x=round((x-r(min))/(r(max)-r(min)) * `xrange') if obj_type == "cases"
replace y=rnormal()^2 if obj_type == "cases"
sum y if obj_type == "cases"
replace y=round((y-r(min))/(r(max)-r(min)) * `yrange') if obj_type == "cases"
* This tells stata to either draph the graphs as it runs the code or wait till the end to draw the graphs. 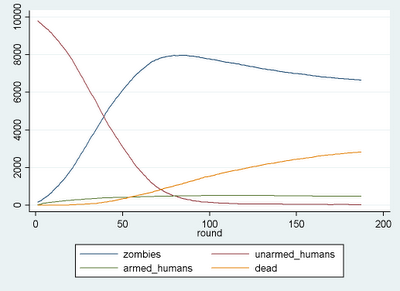 gen weapon_case=1 if obj_type == "cases"
* Then that human either shoots the zombie or misfires shooting at the human. * Checks to see if anybody has initially this person has bullets. replace obj_type = "zombie" if `infested' == 1 & obj_type=="human"
noi di _c " `i'"
* Different specifications at the beginning of the model yield different results.